Ayle Foods Oola, Co. Tipperary wins award for Best in Farmers Market at the Blas na hEireann Food Awards last weekend. Artisan Food Producers Peter and Lorraine Randall of Ayle Foods have traded at Cahir Farmers Market for the last two and a half years. They were delighted to win an award for Best in Farmers Market for Tipperary at the Blas na hEireann Food Awards at the weekend. 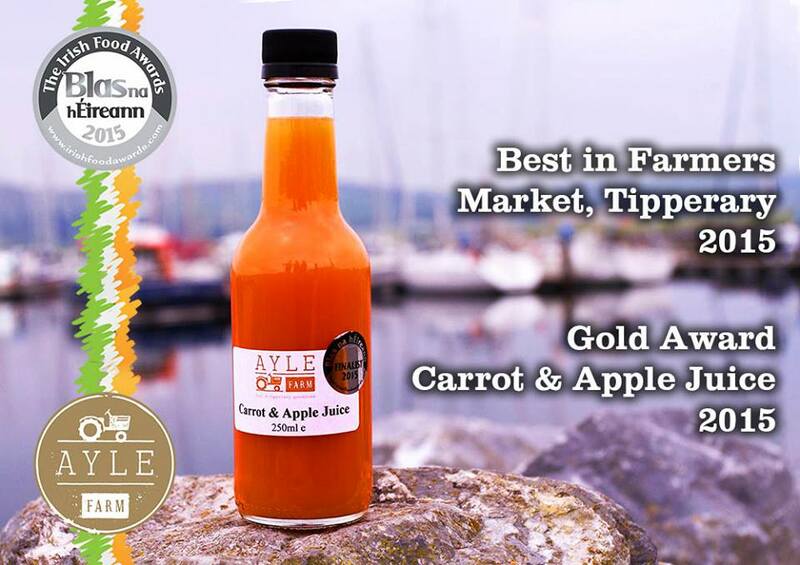 Ayle Foods also won a Gold Award for their Carrot and Apple Juice. This is the third year attending the awards, Ayle Foods have won a Gold Award in 2013 and 2014 for their Beetroot Chutney. They have worked very hard developing the Ayle Farm brand and have received excellent support from the Local Enterprise Office and Supervalu Ireland by being involved with the Food Academy Programme.